In the wake of a recent severe winter storm in the region, Israeli authorities opened the floodgates to discharge the accumulated water, Palestinian officials say. Residents of eastern Gaza reported injuries as well as deaths of livestock and poultry, caused by the Israeli action which allegedly came without prior notification, Gaza's Civil Defense Directorate (CDD) said Sunday. Photos of the Gaza Strip flood have appeared in social networks, but the date when they were taken can't be independently verified as yet. “The [Israeli] army opened the floodgates of a canal leading to central Gaza, which resulted in the removal of sand mounds along the border with Israel,” the CDD announced, according to Palestinian News Agency WAFA. 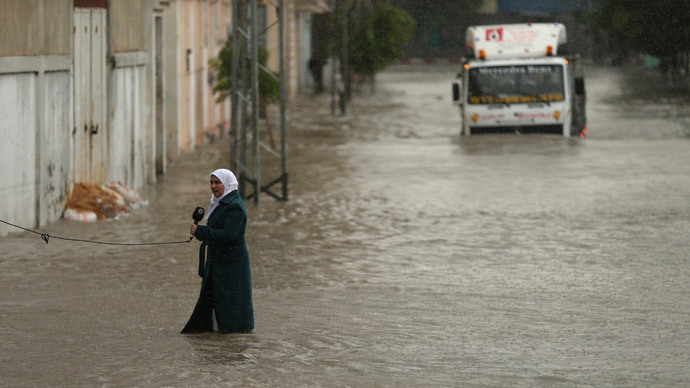 No casualties were reported as a result, but more than 80 families had to flee after their homes filled with water levels sometimes reaching more than three meters, the Gaza Ministry of Interior said in a statement. In a letter to RT regarding the issue, Israel’s Coordinator of Government Activities in the Territories (COGAT) maintained that“the claim is entirely false." "Southern Israel does not have any dams. 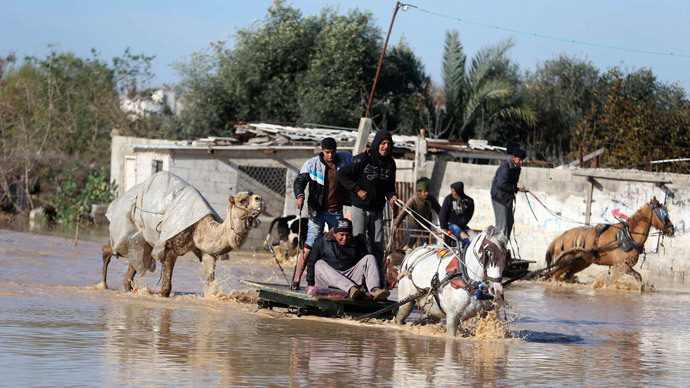 Due to the recent rain, streams were flooded throughout the region with no connection to actions taken by the State of Israel,” COGAT said. The flood reportedly forced the closure of the main road connecting al-Mughraqa district and Nusseirat refugee camp south of Gaza city, leaving hundreds of Palestinians trapped in the floods, a difficult prospect for approximately 110,000 Palestinians left homeless by Israel’s assault last summer. Evacuated families were taken to UNRWA-sponsored (UN Relief and Works Agency) shelters in the al-Bureij refugee camp and the al-Zahra neighborhood. "Israel opened water dams, without warning, last night, causing serious damage to Gazan villages near the border. 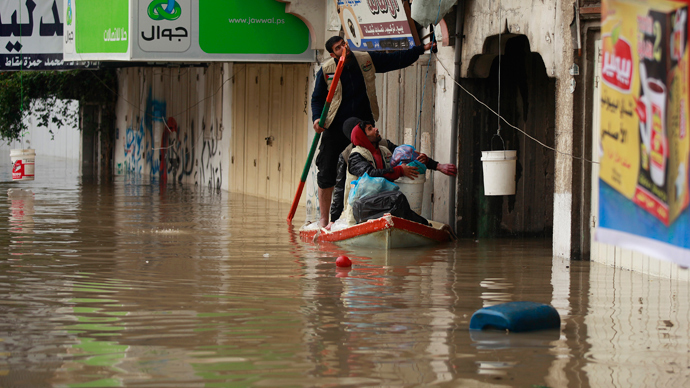 More than 40 homes were flooded and 80 families are currently in shelters as a result,” chief of the civil defense agency in Gaza, Brigadier Gerneral Said Al-Saudi, told Al Jazeera. Further harm could be caused if Israel opens up more dams, warned Gaza Civil Defense Services (CDD) spokesman Muhammad al-Midana, as cited by the Ma'an news agency. A fast-moving water stream is currently flowing from the Israel border through the Gaza valley and into the Mediterranean Sea, he said. The Gaza Valley (Wadi Gaza) used to be a unique wetland ecosystem located in the central Gaza Strip between al-Nuseirat refugee camp and al-Moghraqa. It flowed from two streams, one running from near Beersheba, and the other from vicinity of Hebron. 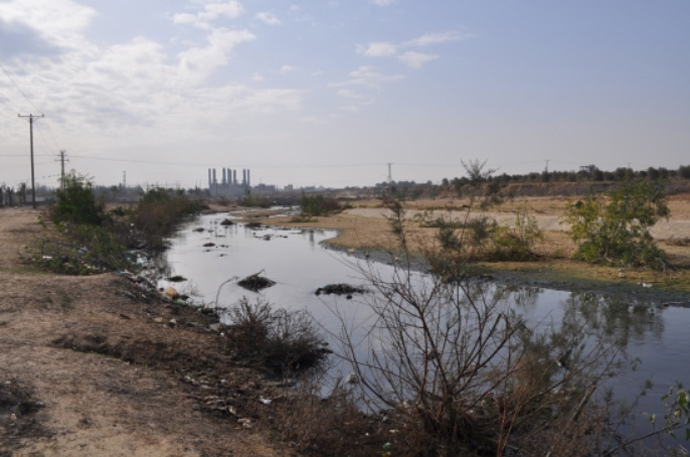 There’s not much water left in Wadi Gaza, as water being mostly used upstream in Israel and the stream running through the Gaza Strip consists mainly of untreated waste from Gaza City, which pumps up millions of liters of sewage into the riverbed. According to media reports, this is not the first time Israeli authorities have opened the floodgates to theirGaza Valley damsto discharge massive quantities of excessive water that accumulated during heavy rains or snowfall.